Diastasis recti abdominis or DRA is when the two rectus abdominis muscles become separated along the linea alba or the fibrous band of tissue that runs from the bottom of the sternum (xiphoid process) to the symphysis pubis. Lay down with knees bent and place two fingers horizontally directly above and below the umbilicus, palm facing you. The degree of separation is measured according to the number of finger widths that can be placed in the separation. A gap of 1 finger or less is considered normal. 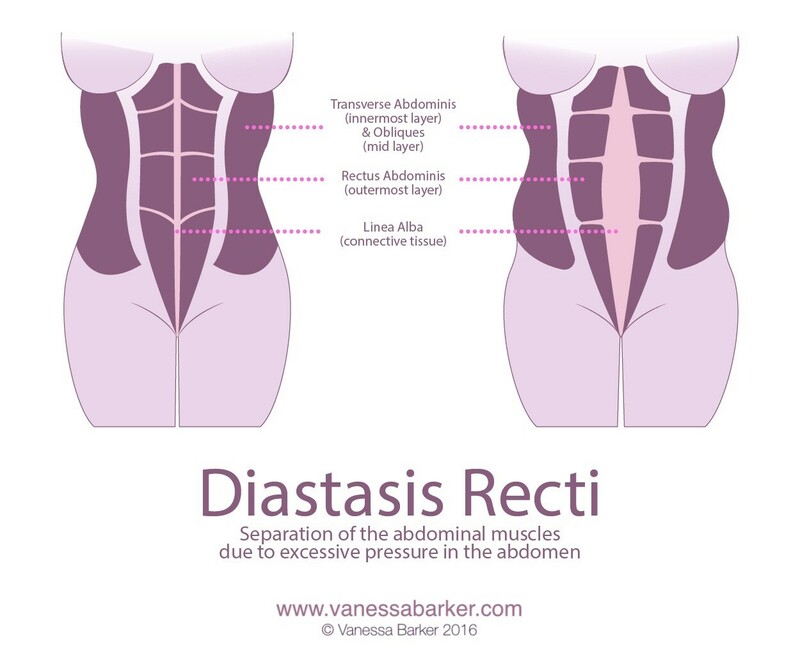 If separation is greater than 2 finger widths and you are still pregnant, do not directly train abdominals as you definitely have diastasis recti and can worsen it. DRA occurs when there are changes in the elastic hormones in the connective tissue, increased stress put on the abdominal wall by the growing fetus, and the movement of abdominal organs. Other contributing factors include fetal size and number, number of previous pregnancies, placenta size, amount of amniotic fluid, amount of weight gain, length of torso and strength of abdominal muscles. Women with strong abs are likely more prepared to resist diastasis recti as ab exercise also increases strength and elasticity of linea alba. It is particularly important to train tranverse abs. A bulge may appear in the abdomen where the separation occurs. This separation usually develops during the third trimester of pregnancy, however sometimes shows up in the second, or postpartum period. DRA is fairly common and affects about 67% of pregnant women. 53% of women continue to see this separation in the immediate postpartum period. 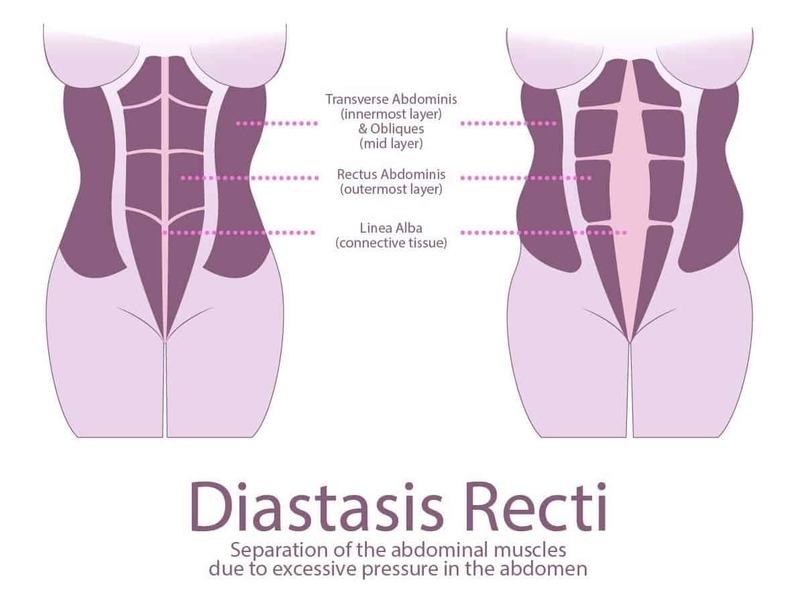 Diastasis recti weakens the abdominal muscles and affects their function. The loss of trunk and pelvic stability, support in posture and abdominal viscera and compromise in respiration and trunk movement leaves to instability in the spine and pelvis. This leave the body more susceptible to injury. It is not proven either way whether training core before pregnancy can reduce risk of developing DRA, however it is theoretically believed that women who exercise before and during pregnancy have stronger muscle activation and control, which reduces strain on the linea alba. Are you free and clear to train core? You still have to adjust your core training during pregnancy, even if no diastasis recti has appeared yet. Here are some great, pregnancy safe core exercises if separation is less than 2 fingers and you do not experience any cramping or pain during these movements. – Avoid upper or lower body exercises that involve spinal rotation because the internal and external obliques are indirectly attached to the rectus abdominis and exert a pull that may widen the gap as they contract and shorten. – Abdominal compression and pelvic tilt exercises train the deeper transverse abdominis and involve pulling the navel toward the spine while slowly and forcibly exhaling. Great news!!! It is never too late to correct this frustrating condition once your doctor gives you the approval to return to exercise post partum. Depending upon the severity of your separation, diastasis recti can be reversed in anywhere from 6 weeks to a year. It is important to gauge your progress by reevaluating your separation using the method explained earlier and not to push your body to heal too quickly. These things can take time, but your patience and attention to detail with form will pay off. If you’d like my help to get a flat stomach again, use my post-partum diastasis recti rehabilitation program! Over a decade in the fitness industry has provided Coach Julie Germaine with valuable experience. This fitness cover model has been featured in hundreds of magazines and worked with many multinational corporate sponsors. Julie has successfully helped thousands of clients lose weight and keep it off using her methods. Since 2005, she has been devoted to changing lives through incredible weightloss transformations. A crowned 2x International Pro Champion herself, Julie once specialized in physique consulting for bikini & fitness models, providing contest prep internationally to hundreds of winning amateur & pro athletes. Recently, Julie has begun her own family and became pre & postnatal certified to help women enjoy healthy, active pregnancies. Learn more about Julie's online training programs and subscribe to her emails for fitness tips that are suited to your unique goals. 3 For One! You Asked For It! Stop wasting precious time & subscribe for more free fitness tips from Coach Julie Germaine! Julie Germaine has devoted her life to her passion for fitness and helping others reach their unique goals. Julie is a certified personal trainer and, since 2005, she has helped thousands of men and women in many different countries achieve their dream bodies through incredible physique transformations. A decade-long competitive career as a Professional Fitness Model took Julie around the world to step on stage with the best physiques on the planet. She is proud to have won 2 International Championship Titles! Site Development by SMB Master | Graphics by Julie Germaine.